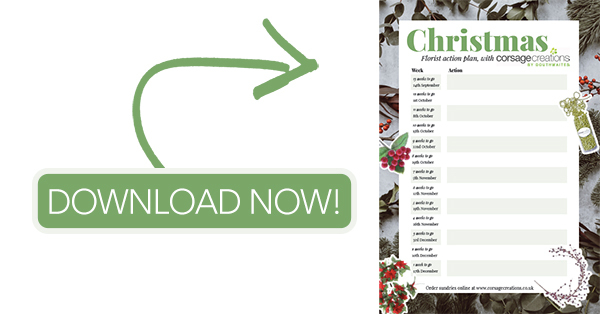 Get prepared for Christmas with our festive sundries and florist business planner! Our latest range of products is officially out now and just in time for, you guessed it, Christmas! Live on the web-shop is a whole new selection of festive items, available to order right now so you can sleep soundly knowing your sundries are all set – well ahead of the season. You’ll fine quality artificial berries and poinsettias in a range of styles from sprigs to wreaths and garlands, and in red, burgundy, white and gold. Our popular glitter butterflies have had a festive makeover and our bead chains, available in gold, silver and rose gold and in different thicknesses, will add a Christmas twist to anything from hand-ties to the till. We’ve also got all sorts of mixed foliage and berry sprays, Christmas picks, foliage sprays and more. Browse the brand new Christmas range now! Sundries are something you can sort well in advance to allow loads of time to think about all those other essential jobs … like festive marketing, flower ordering, product planning, price lists and perhaps even stocking up on the mince pies. • work out price lists, costings and predicted sales? • prepare and action your Christmas marketing? • put in your flower orders – and check out wholesaler pre-order offers? • plan your staff rota and/or hire extra hands? • plan your Christmas products and recipes, from wreaths to grave posies, gift flowers to Christmas trees? Head on over to corsagecreations.co.uk to shop our Christmas sundries range, available now!